Sarah Greenberg talks to her friend Pippa Dillon-Fordyce in front of the York University subway station. For Ms. Greenberg, a 26-year-old master’s student, the new station will make her commute from the eastern Beaches much faster and more direct. For the first time in its 96-year history, Toronto Transit Commission trains are about to start carrying passengers outside present city limits. 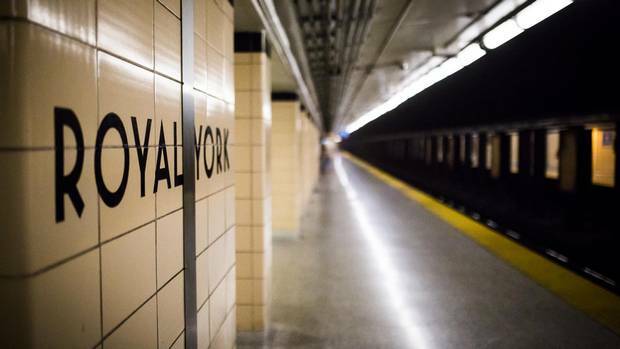 The Toronto-York Spadina subway extension (TYSSE) goes into regular service on Sunday, 11 years after the province sprang the plan on the TTC. It's the first expansion of the TTC subway system since 2002 and marks a turning point for the agency. Outgoing leader Andy Byford, who stayed to see the line open, believes Toronto needs to prioritize future projects on "demonstrable need" over "speculative" ones. But that advice will have to compete with the growing power of the suburbs, and the eagerness of Queen's Park to court them. A ribbon-cutting for the TYSSE on Friday will feature politicians from across the spectrum. Amid the back-slapping and mutual congratulations, shadows will linger. The line is opening years late and is expected to cost hundreds of millions more than proposed. While attempts to settle claims and counterclaims make the final price-tag unknown, the best estimate is about $3.2-billion. In return, the agency is getting an 8.6-kilometre subway extension expected to have a modest ridership. Some of the six new stations are projected to be among the least used on the entire subway network. And in a sign of how this extension could influence the next generation of transit, advocates of other regional expansions use the line to justify their own pitches. For many, however, this opening is an opportunity. Supporters see the potential for shorter commutes, less congestion and a transformation in Vaughan. "It's truly a monumental event for Toronto, and for that matter for York Region," Mr. Byford said. People wait in line for a TTC bus at York University. The provincial Liberals had been kicking around the idea of extending the Spadina subway to York for years, but in 2008, the provincial budget proposed extending it beyond to Vaughan. Read more below for a by-the-numbers breakdown of where the extended subway line goes and how much it cost to build. An extension to the Spadina subway began, as do many transit projects in Toronto, with an ambitious politician drawing a line on a map. Years later, its future was secured in a bit of private political horse-trading between Ottawa and Queen's Park. The story begins in 1986. In his memoir, provincial politician Greg Sorbara describes being a rookie, button-holing the man sitting beside him on the Liberal government benches, a man who happened to be the transportation minister. He advanced his idea that there should be a subway connection to York University, extending the current Spadina line. The idea became part of the party's election platform. Then the Liberals lost the next two elections. In 2003, the party returned to power and, three years later, then finance minister Dwight Duncan announced the line in the provincial budget. But this wasn't a subway just to York – it was one that crossed the city limits and went to Vaughan. Mr. Sorbara, who represented a Vaughan riding and was finance minister both prior to and after the announcement, but had stepped down temporarily because of an RCMP investigation, said later he had no idea the project would be included. The TTC was also surprised, having long before concluded that extending the line north of Steeles Avenue was unjustified by current or projected population densities. Critics pounced, pointing out that the end point for the proposed new line, near Jane Street and Highway 7, was a big-box Wal-Mart parking lot, surrounded by a sea of mostly low-rise industrial buildings. It had none of the urban density usually associated with underground mass transit. Then-mayor David Miller said recently that he had always thought a subway going as far as York University made a lot of sense. It would extend higher-order transit to people who didn't have it, link the northwest of the city to the rail network and offer relief for the Yonge line. Howard Moscoe, the city councillor who was at the time the political head of the TTC, remembers the province's aggressive pursuit of having the line go right to Vaughan: "We didn't have a choice." Once back in the finance portfolio, Mr. Sorbara was pushing not just the city. He describes in his memoir how he badgered his federal counterpart, the late Jim Flaherty, to have Ottawa pick up part of the bill. As he tells it, the two men struck a deal in a private room in Vancouver: Ottawa would fund part of the subway while, in return, the province would extend Highway 407 east into Mr. Flaherty's riding of Whitby-Oshawa. "We shook hands," Mr. Sorbara wrote. "We had a meeting of the minds." 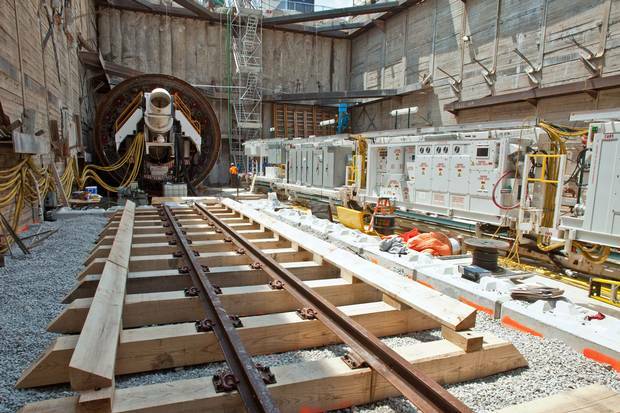 June 17, 2011: Tunnel construction begins at the Sheppard West launch site of the subway extension project. Ground broke on the TYSSE in 2009, but the timetable soon grew longer. March 13, 2013: Then-mayor Rob Ford tours one of the TTC stations under construction with Lisa Raitt, left, then the federal minister of labour. In his memoirs, Ontario cabinet minister Greg Sorbara describes badgering the Conservative federal government of the time into agreeing to fund part of the project. May 4, 2015: TTC workers give a site tour of Pioneer Village station. 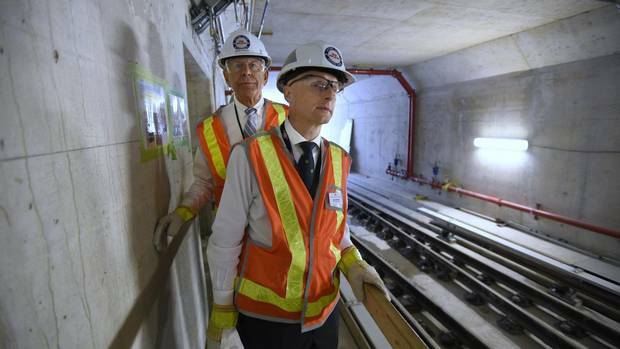 A year earlier, TTC CEO Andy Byford had ordered a review of the project that found it had only a 50-50 chance of finishing by the end of 2018. He pressed for new funding and fired senior staffers and reorganized to get it done by this year. Dec. 4, 2017: The York University subway station. The TTC’s Mr. Byford says the scope and design of the stations changed a few times and were scaled back somewhat. Politicians broke ground on the TYSSE in 2009. The line was supposed to open six years later, but it didn't take long for that timeline to prove not feasible. The target slipped first to 2016, and then it threatened to slide a lot further. 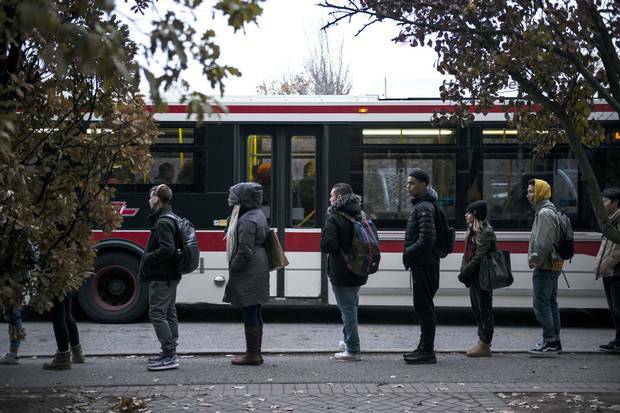 Mr. Byford, the TTC chief executive, points to a series of problems. 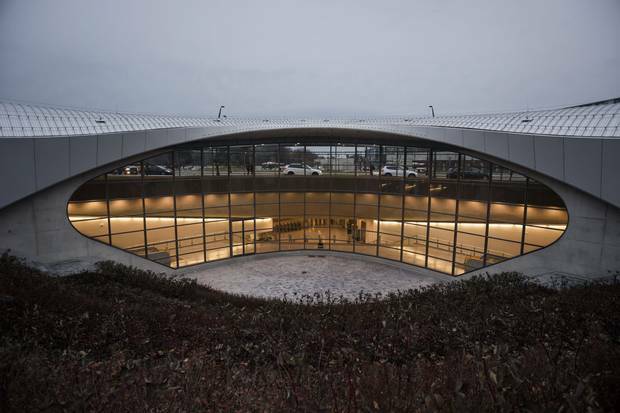 The scope of the stations changed a few times, going from "utilitarian box structures to something much more grandiose" and then being scaled back to the current, still quite grand, designs. Cold winters caused delays, as did the death of a worker that shut down construction for months. In 2014, Mr. Byford ordered a review that revealed the project had only a 50-50 chance of finishing in the final three months of 2018. By his own account, he hit the roof. He fired two senior staffers and asked politicians to spend an extra $400-million, with Toronto paying 60 per cent and York Region covering the rest. He also sought to hand over project management to construction giant Bechtel, without getting competitive bids. A new deadline was set for end of 2017. "I certainly [put] my strong support behind the solution," Toronto Mayor John Tory said. "It got us on track to having this thing open at a proper time." Thirty-three months later, with the project nearing completion, Mr. Byford argued he made the right decision. "We wanted certainty," he said. "We bought certainty." 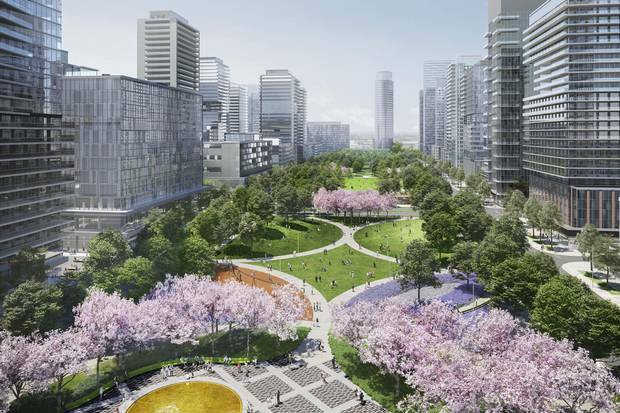 An artist’s rendering of the dense development that billionaire developer Mitchell Goldhar, the Vaughan area’s biggest landowner, has planned for the neighbourhood of the new Vaughan Metropolitan Centre subway station. A 15-storey tower opened near the subway station last year. It is home to employees of the accounting firm KPMG and other tenants. Mr. Goldhar says he had a ‘gentleman’s agreement’ with Vaughan’s mayor to open something near the subway site before the line was ready. 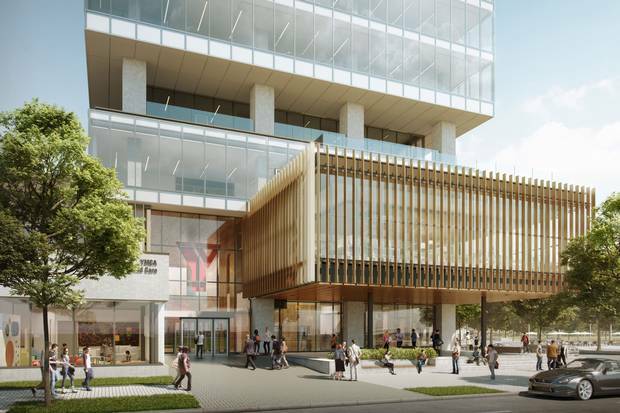 Next door to the KPMG building, work is under way on a PriceWaterhouseCoopers building, which will also feature a 100,000-square-foot YMCA recreation centre and a library. Maurizio Bevilacqua, who lobbied for the line when he was a Liberal MP and has been mayor of Vaughan since 2010, dismisses the notion that Toronto has built another subway to nowhere. Instead, he argues, the new transit line has come before development, allowing subway-friendly densities to be created from next-to-nothing on top. But years ago, Mr. Bevilacqua was worried about the optics. He told Mitchell Goldhar – the area's biggest land owner and the billionaire behind big-box developer SmartCentres who first brought Wal-Mart to Canada – that he must have something built before the line was ready. Mr. Goldhar describes his pact with the mayor as a "gentlemen's agreement." 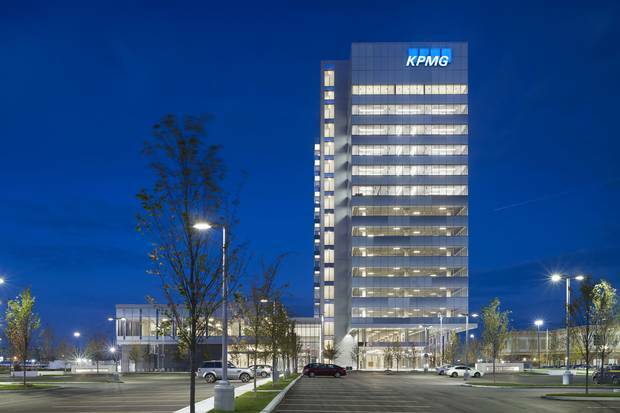 His 15-storey tower housing employees of the accounting firm KPMG, as well as other tenants, opened last year. Work is under way on a PriceWaterhouseCoopers building next door, which will also feature a library and a YMCA recreation centre. Three planned condo towers – standing 55 storeys – are sold out. Most of the area still remains a mix of construction sites, parking lots and pre-existing industrial low-rise and big-box retail. But much more development is planned. Mr. Bevilacqua says the new "urban feel" of the place is already palpable, and the seeds have been planted for a different way of life in the 905. Mr. Goldhar owns half of his 100-acre plot here in partnership with Smart Real Estate Investment Trust, and the other half with his partners, suburban developers Rudy Bratty and Silvio DeGasperis. Other developers are active nearby. Having one main developer control so much of the land around a new subway station is unusual. But it has allowed Mr. Goldhar to throw himself into custom-creating a new dense community with what he says will be a European, urban sensibility. A parking lot to the west of the subway station, for example, will become a courtyard surrounded by retailers, restaurants and boutiques. "It'll have character and feel. And in the middle of it will be this pedestrian space," Mr. Goldhar said. "So when you come off the subway … you'll look down the middle of this huge piazza kind of thing like you do in the centre of great cities of Europe." 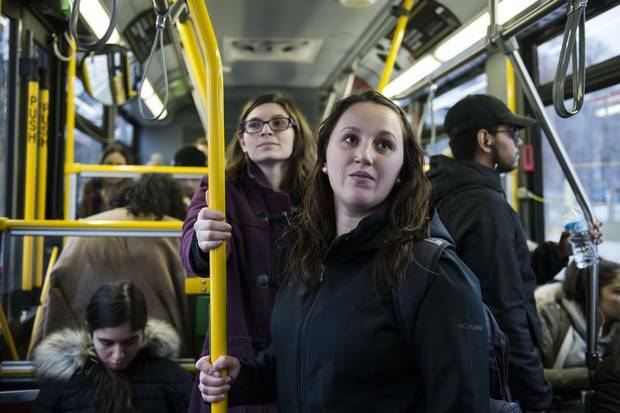 Without the extended subway line, Sarah Greenberg needs a time-consuming combination of buses and subway rides to get to campus at York University. ‘I leave two hours before I’m supposed to be there,’ she says. 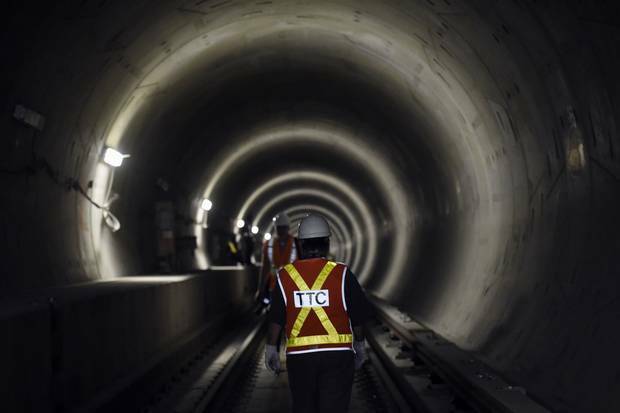 For Sarah Greenberg, extending the subway to York University will be a game-changer. She is pursuing a master's degree in disaster and emergency management at York and commutes from the eastern Beaches, by bus and subway. "I leave two hours before I'm supposed to be there," said the 26-year-old, who is looking forward to a faster and more comfortable trip. Modelling by the regional agency Metrolinx suggests the line could lead to a modest reduction in Yonge subway crowding. But other effects are likely to flow from this project as well. The TYSSE has given weight to a growing view at city hall that, in the debates over new transit lines, the number of possible riders no longer matters as much as it once did. Toronto city councillor and TTC commissioner Glenn de Baeremaeker notes the line's ridership could have been met with light rail, or dedicated bus lanes, but the governments chose a subway. "Whether it, quote, merits on a technical sense the ridership or not, it's a philosophical decision the city has made and society has made," he said. "People like subways." In the same vein, boosters for other proposed transit megaprojects – including the $3.35-billion subway extension to Scarborough – regularly point to the TYSSE. If the ridership to Vaughan warrants a subway, they say, so does their area. For Mr. Byford, though, the next subway needs to be one with an "overwhelming" business case: The proposed relief subway line, which would run from the Danforth south and then west into the core, diverting people from the Yonge line and letting pressure off the ever-more-crammed interchange at Yonge and Bloor. "You know, people say '[build] there and they will come.' 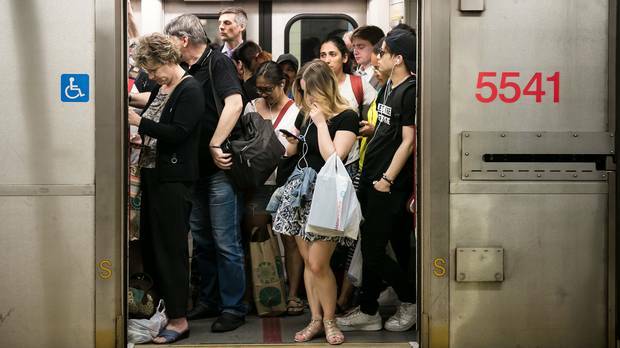 I think the most pressing need is to now focus on subway expansion where it's not so much that they will come, it's [that] there's already a demonstrable need." *One-way hourly ridership, in morning rush **Parking spaces are TTC-controlled parking only and do not include private commuter or other parking lots. Suicide on the subway Nearly two dozen people seek to end their lives each year on the TTC. An analysis by urban transportation reporter Oliver Moore and data journalist Tom Cardoso uncovers the worst stations. Signals from the future On Toronto’s Yonge-University-Spadina line, upgrades to a decades-old signalling system could get more trains running in less time by 2019. Oliver Moore explains how it works. Bye bye, Byford Toronto's transit boss, departing for a new job in New York, gives a Q&A with The Globe's Oliver Moore discussing his tenure and sharing advice for his successor. Editor’s note: An earlier version of a graphic with referred to the number of parking spaces available. These are for TTC-controlled parking only and do not include private commuter or other parking lots.